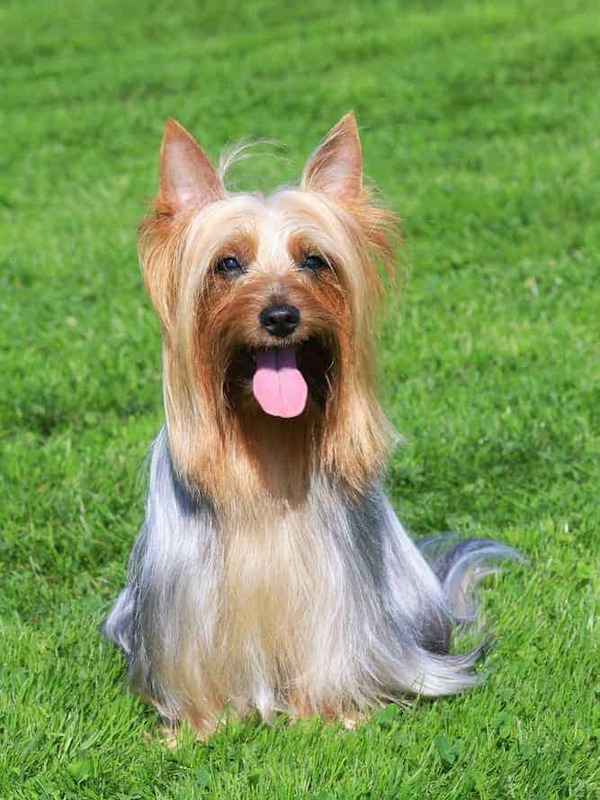 Hailing from Australia in the 1890s, the Silky Terrier temperament is joyful and inquisitive. 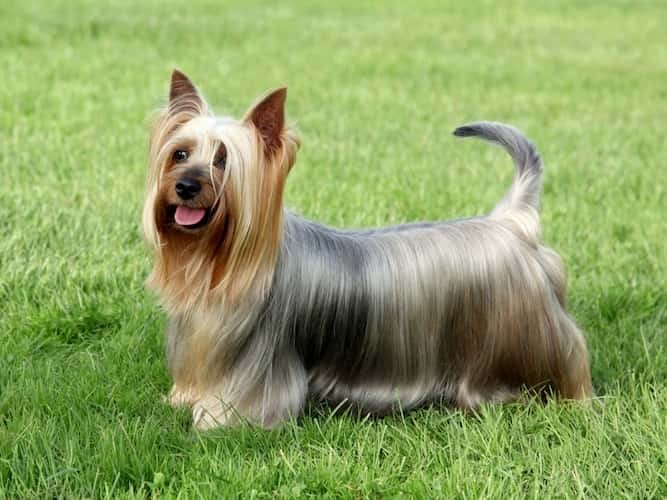 Australian breeders crossed the Yorkshire Terrier and native Australian Terrier to create the Silky Terrier. Breeders wanted to combine the body of an Australian Terrier with a coat of a Yorkshire Terrier. Like their Terrier ancestors, Silky Terriers – also called Silkies – were bred for hunting small vermin. Silky Terriers love their humans. They are happiest when part of family activities. The Silky Terrier's friendly nature means they are not nervous or shy around new people. Another Silky Terrier temperament trait? Bossiness. Silkies have that assertive “terrier temperament” that can come across as bossy. Silky Terriers, in true Terrier fashion, love to dig. They love to chase, and they are quick – so a securely fenced-in yard is a must. If you have a problem with digging read here. The Silky Terrier dog is a great family pet – especially if they are raised with kids. However, they have a strong personality so families with children over 10 are best. Silkies are also small, and a young child could accidentally drop him or play too rough. Silky Terriers get along very well with other dogs if they are raised dog-friendly. There may, however, be some rivalry for treats or attention. Their true Terrier heritage means they love to chase small animals. A home without cats or other small animals is probably best. This is a high-spirited, energetic breed. They are always up for an adventure and love a good challenge. But, with enough exercise, the Silky Terrier does well in apartments. 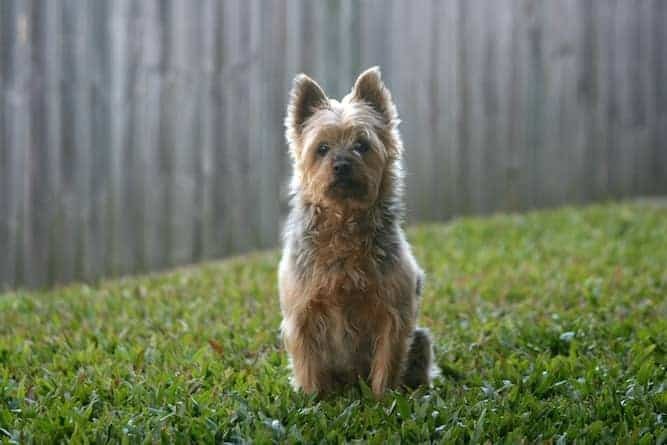 Make no mistake, the Silky Terrier makes a great watchdog – they’ve even been accused of barking too much – but they’re too small to be effective guard dogs. Although they are intelligent, the Silky Terrier’s self-assured temperament can make training difficult. Silky Terriers require firm yet gentle training. Housetraining can be a challenge but with consistency and repetition, they will learn. Keep training sessions fun and full of positive reinforcement. The Silky Terrier breed can also be possessive when it comes to food and toys. Teach them that it is okay to share as soon as possible to avoid this. Socialize your Silky Terrier to as much as possible. Socializing your Silky Terrier will teach them to be a calm, friendly adult. Unsocialized Silkies can be overly suspicious of strangers. Ready to add one of these feisty pups to your family? You’re certainly in for a treat. To figure out whether you’d like to purchase a Silky Terrier for sale from a breeder or adopt one from a rescue organization, consider your lifestyle. Silky Terrier puppies are cute – but they are also puppies. They require time, dedication, and patience. Don’t have time to train a puppy? Consider adoption. Silky Terriers in shelters are often older and trained. The Silky Terrier Club of America is a great tool to help you find the perfect Silky Terrier. Purchasing a Silky Terrier puppy from a breeder will cost between $600-$800. The Silky Terrier price is dependent on demand, litter availability, and location. Expect to pay more for Silkies with an American Kennel Club (AKC) champion bloodline. If you have decided on Silky Terrier adoption, your first stop should be the Silky Terrier Rescue website. Not only do they have Silky Terriers available for adoption, but they also share success stories and have adoption FAQ. Adoption is also a great choice for those looking for a Silky Terrier mix. Shelters often have more mixes than purebreds available. Mixed breeds are perfect for families looking for several different personality traits rolled into one dog. To find Silky Terrier breeders, check out the AKC Marketplace. The AKC Marketplace allows you to search for Silky Terrier breeders based on location, breeders of distinction, champion bloodlines, and whether puppies are available. Choose several breeders in your area and plan visits. Always meet a breeder prior to committing and bring a list of questions. Reputable breeders will be able to answer your questions with confidence. They should also ask you questions in return to see if Silkies are the right breed for you. 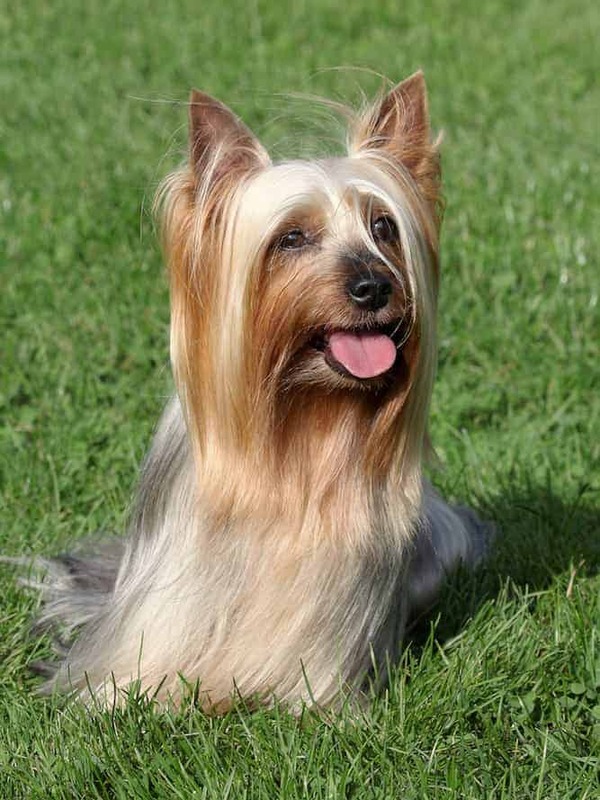 The Silky Terrier lifespan is between 13-15 years. A Silky Terriers weight is around 10 pounds and they are between 9-10 inches tall. Silky Terriers have a striking coat – it’s long and sleek with a part down the back. They are found in rich tan with various shades of blue. Contrary to what you might think, Silky Terrier grooming isn’t all that high maintenance. A thorough brushing two to three times per week, as well as before bathtime, is all they need. A bath just about every month will keep them clean and free of tangles. Most owners decide to keep the hair long, but Silky Terriers with short hair is another option – especially if you don’t have time for two to three brushes per week! Once or twice a month, trim their nails. Check their ears weekly for any bad odor or redness, as that is a sign of infection. And a Tracheal Collapse – often seen in small breeds, it affects their airways. Note: As you can see above your Silkies are prone to suffering from quite a few serious ailments. It's highly recommended that you get a guide such as The Ultimate Guide to Dog Health to keep at home. While this won't replace your Vet it is a good companion that helps you prevent some of these issues before they turn into full-blown pain and sickness for your Silky. They may be small, but Silky Terriers need a moderate amount of exercise. In fact, they require more exercise than most of the toy group breeds. Daily exercise is a requirement for this breed. They do well with an owner who knows how to channel their energy into daily walks, playtime, and even training for sports. With their small stature and feisty personality, the Silky Terrier makes a wonderful family companion – especially those in apartments. Though bossy, Silky Terriers are intelligent and can be trained with proper guidance. If you’re looking for a self-assured personality in a pint-sized body, the Silky Terrier is for you!